Do I need a lawyer? How do we retitle the house? How can I pay for the funeral? Can I continue to use their bank account? What if they did not have a will? What is probate? The death of a family member is one of the hardest things to go through. During that difficult time, the last thing you want to do is worry about financial and legal problems. But quickly you find that you need answers to these questions. Here are some quick answers to common questions about this difficult time. It is possible that you will need a lawyer to help you. At a minimum, however, you should consult with a lawyer to find out. Many lawyers (including Stotis & Baird Chartered) will agree to a free consultation. During that meeting they can tell you whether you will need representation, or if you can manage this process on your own. Sometimes the legal help that you need will be very little. Legal help will be necessary if the estate must go through probate. Probate is a court process that is required when a person dies with certain types of assets. For example, if the deceased owned a home in their own name (not jointly owned with another person), then it is usually necessary to open a probate estate. An executor represented by a lawyer can usually complete the probate process within 8-14 months. The lawyer must locate every asset of the person who died and every debt that they owed. Once they establish to the court that the debts have been paid, they assist in paying bequests that were written in the will. Illinois law requires the person who is in possession of the original will to file it with the court within 30 days. One of the first questions that families face is finding the will. Sometimes it is in a safe deposit box at a bank. If you do not have access to that box, there is a legal process for obtaining access. Some attorneys agree to hold the original will for their clients. If you find a copy of a will, consider calling the attorney listed in the document to see if they have the original. If you cannot find a will after a thorough search, it is possible that the deceased never prepared a will. 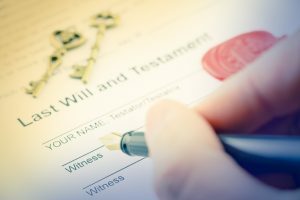 What if somebody dies without a will? Although it is a good idea to have a will, many people never prepare one. When a person dies without a will, the state law determines who will receive their property. For example, if a married person dies, and has no children, their spouse would receive property. For a married person with children, the law divides the property between the surviving spouse and the children. There are a series of rules that determine who has first priority. Can I still use the bank account of the person who died? No. Once somebody dies, you cannot access their bank account unless you were a joint owner of that account. Eventually it will be possible to get access that money in one of several ways. A qualified estate lawyer can help you to find out the correct way to close the account. If somebody had a joint account with the person who died, they can use money from that joint account to pay for the funeral. Did the person who died have a life insurance policy, you can often arrange for an expedited payment of that insurance benefit. If the person who died had money, but you cannot access it right now, you may be able to borrow the money from a friend or family member and pay them back after you get access to the account. Discuss the problem with the funeral home. They deal with this issue regularly and may be able to help. If the person who died had a small estate (no real estate and less than $100,000 in assets) you may be able to access their accounts quickly through a document known as a small estate affidavit. A lawyer can help you with that process. The executor who has been named in the will to carry out the wishes of the deceased. If a person dies without a will, the court will appoint an “administrator” to carry out the tasks normally performed by an executor. The job of the executor is to find the assets of the deceased, pay the debts and then make sure that any remaining funds are paid out to the people listed in the will (called legatees). The executor is entitled to a fee for acting as executor, but does not receive anything else unless they are an heir or legatee. Often people pick a relative who is good with finances or has a legal background to act as executor. The executor does need to have any special training. Most of the time, the executor has a lawyer who helps them through the process. The death of a family member is always stressful and it is important to get good advice. Please feel free to call us for a free consultation. We have Spanish speaking staff available to assist you.